Hi there! Welcome to the Gingerbread Blog Hop! I LOVE the gingerbread theme. I try and add more to my house each year! If you came from Ashley you are in the right spot! If not, be sure to start here! I made two cards for you today! Your little gingerbread people look so cute with the candy background! Love your Cards!! And thanks for being part of a very fun and Inspiring Hop!! TFS!!! i love your sweet ginger girl and ginger boy cards...the paper is great. Thanks for sharing. Your cards are adorable!! Thanks so much for sharing. Love the different uses of the twine, makes them match so nicely! 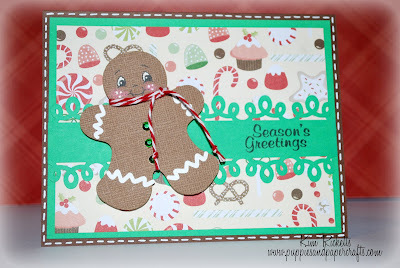 Love your sweet gingy cards, Kim.......great projects!! Love gingerbread people. Your cards are so, so cute and love the paper. Aww your little Gingy cards are Adorable. They are adorable! Love the border punch - just perfect for these cards! I love these cards. 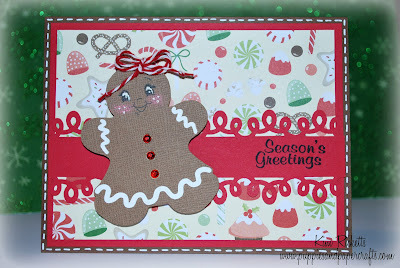 Just love the pattern paper and the gingerbread people are so stinkin cute! Thank you so much for being a part of the hop.